Surrey Libraries supports over 600 reading groups across the county. We provide multiple copies of books, including brand new titles, to private and library-hosted groups. Groups can choose any title in Surrey stock as long as there are at least 20 copies in circulation. To help you choose, please find at the foot of this page a regularly updated list of fiction and biography titles. This list is not exhaustive and staff at your local library will gladly make recommendations. If you have checked our catalogue and find we have insufficient copies of the book you want, please ask us to consider purchasing more copies. We encourage reading groups to review books they have read, and read reviews left by others online. Read the latest copy of the library reading group newsletter (PDF). Do you enjoy a good read? Relish a lively conversation? Like meeting people in a friendly environment? 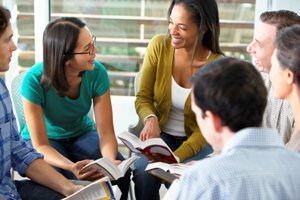 Why not join a library-hosted reading group? Find out more about starting a reading group including borrowing guidelines for book loans to reading groups. Have a look at these resources for reading groups which include lists of available and most popular titles, reading lists and links to reading and discussion websites. From time to time we look for volunteers to host one of our library-based reading groups. Follow your library on social media, look out for displays in your local library and browse some reading lists on our catalogue. Enjoy your reading! A list of titles suitable for reading groups or book clubs as we have enough copies in stock to facilitate them.